Garsdale Head is a hamlet mainly within the South Lakeland district of Cumbria. Historically part of the West Riding of Yorkshire, the hamlet is now on the border with Richmondshire, North Yorkshire and lies within the Yorkshire Dales National Park. Garsdale Head is in the civil parish and valley of Garsdale and on the A684 between Hawes and Sedbergh. The hamlets main landmark is Garsdale railway station on the Settle to Carlisle and Wensleydale Railways. Garsdale railway station was previously known as Hawes Junction as it was the junction of a 6 mile branch line to Hawes. The station comprising of three buildings was designed by the Midland Railway company architect John Holloway Sanders in a different style as used at all the other stations on the route. Around 1876, the year the Settle to Carlisle Line opened, the Midland Railway also built sixteen railway cottages for its employees next to the station and a further six cottages near to the Moorcock Inn soon afterwards. Hawes Junction was renamed Hawes Junction and Garsdale in January 1900 then renamed again in September 1932 as Garsdale. In the 1980’s the Settle-Carlisle railway line was under threat to closure. One of the earliest campaigners against the closure was Graham Nuttall co-founder of the Friends of the Settle-Carlisle Railway Line. He and his dog, a Border Collie named Ruswarp, were inseparable and his paw print was deemed acceptable as a valid signature amongst tens of thousands objecting the closure. After the line was saved in 1989 Nuttall and Ruswarp disappeared while walking in the Welsh hills in January 1990. In April a walker found Nuttall’s body by a mountain stream. Ruswarp who lay nearby, still alive after staying with his dead master for 11 weeks, had to be carried off the mountain. The station closed in May 1970 and reopened in July 1986. A bronze sculpture of Ruswarp stands on the south platform in memory of Graham Nuttall, Ruswarp and the campaign to save the line from closure. It was unveiled on 11th April 2009 and the station waiting rooms, which were out of use due to leaking roofs, were refurbished and reopened to the public as part of the ceremony. Close by is the spectacular Dandry Mire/Moorcock Viaduct, with its 12 arches it stands 50ft high and is 227 yards long and is part of the Settle to Carlisle line on which steam trains run regularly. Originally the crossing of the mire was planned to be an embankment, but when construction started all the earth that the wagons brought in disappeared into the mire and so a viaduct was built. Hell Gill Force is a small but stunning waterfall near the start of the River Eden. 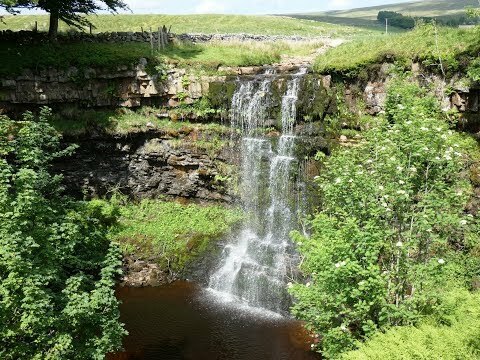 It is situated where Hell Gill Beck becomes the infant River Eden just inside the border of Cumbria between Garsdale Head and the Mallerstang Valley. Nearby is Ais Gill Summit the highest point of the Settle to Carlisle Railway. The waterfall is a single drop fall of about 8 metres (25 feet) and is said to be the highest waterfall on the River Eden. Hell Gill Beck lies on the border between Cumbria and North Yorkshire and is also the north western border of the Yorkshire dales National Park. Leave the car park and turn left downhill past the station to the main road. We cross straight over and go through the gated stile and bear left slightly uphill to go through the gate ahead. We keep heading forward on a very faint path with the wall on our left but soon start to bear right slightly to stay on top of the hill with the stream down below. We go through a gate and head forward on a grass path towards the lone tree in the distance. At the tree we go through the gate to the right of the farm then head forward over the stile in the wall and keep ahead to the left of an old ruined barn. We soon follow an arrowed post to a wall we go through and make our way down to the road. We turn right and follow the single track minor road past the house, Moor Rigg, ignoring the footpath on the left go through a gate and continue to East House where we bear right on the track to go through a metal gate. We now turn right and follow the wall. At the second signpost we turn left and head uphill to a wall and a gate. We go through the gate and head slightly downhill close to the wall on our right. When the wall bends slightly we start to bear left on a very faint path. The railway line and a building at the other side soon appears down on our right and we keep heading forward until we reach some old abandoned farm buildings, High shaw Paddock. We go through the gate to the right of the farm and keep heading forward through the fields and gates until we arrive at the road. We turn left onto the road then right at the welcome to Cumbria sign just before Aisgill Moor Cottages and follow the track crossing over the railway line to Hell Gill Force. At the top of the force we turn right and follow the track with the stream on our left passing two barns to arrive at a farm. We pass to the right of the farm and head forward to the trees then turn right through a gate onto the track called The High Way. The track soon splits and we bear left past a no vehicle sign. We continue ahead passing over a stream, past an old abandoned farm house, cross a second stream then over the footbridge across the third stream. At the ruined building of High Dyke we turn right at the footpath sign and go through the two gates before heading steeply downhill to Blades farm at the bottom. We walk to the left of the farm then turn left along the track. We soon come to the river and we keep heading forward to the bridge. We cross over the bridge then bear left following the path to the Moorcock Inn. We turn right along the road and take the footpath on the left. We pass under the viaduct and follow the path with the railway line on our left back to Garsdale Station and the car park. This is a moderate walk on grass and gravel paths/tracks and short distances on tarmac road. Some of the paths are very faint and there are is a steep descent. Approx 8.9 miles allow 3½ – 4 hours using OS Explorer Map OL19, Howgill Fells and Upper Eden Valley. This walk is done clockwise. Start point: Garsdale Station free car park. Garsdale Station is at Garsdale Head on the border of Yorkshire and Cumbria between Hawes and Sedbergh. From the A1 take the A684 to Bedale, Leyburn and into Hawes. At the end of Hawes keep following the road round to the right on the A684 towards Sedbergh. Pass through Appersett and continue on the A684 after passing the Moorcock Inn on the right take the next left. Go under the railway bridge and the car park is on the right. Parking: Garsdale Station free car park. There are public toilets on Garsdale Station. There is no refreshments en-route but there is the Moorcock Inn close by or alternatively there are public toilets, a good range of shops, tearooms, cafes, an excellent chippy and four pubs The Crown, The Fountain and The Old Board Inn in the Market Place and The White Hart Inn in Main Street in Hawes.